This is Penny Zenker. On this show we explore your greatest potential by tapping into the ten core elements of time and energy management. I want to thank all of you for tuning in and sharing your thoughts on Facebook and Twitter. Today we are talking about Proactivity. This is the part of productivity that keeps you ahead of the cure and not only more productive but consistently more productive. When done right, it will also create even greater balance for you because you aren’t the most important player in your business anymore. So that your business can continue to thrive without you. Proactivity is what allow you to move up to even greater heights of success. Proactivity is part of sustained ability which is the third and last blade of my productivity windmill. The windmill has a gear mechanism that works from within. The smoother, the more consistent, the faster the blades turn, the more productive you tend to be. In taking charge of your productivity there are 3 segments or blades that are critical. They are championship psychology, winning strategy and sustainable results. Without all three of these, your windmill is underpowered. It turns, but not optimally. Proactivity essentially creates a cycle to keep the blades turning. It’s that focus on value and constantly looking for ways to provide more value, better value, and faster value. Basically, proactivity is the oil that keeps the gears from rusting and malfunctioning. Its preventative maintenance. Its knowing where you want to go, anticipating challenges and having laid the groundwork before you even get there. Today I am joined by author and international phenomenon, John Tschohl. You are going to learn the role that psychology plays in proactivity. What are the common barriers that hold people back from moving up in their career? And lastly, the important part of proactivity. John Tschohl is called the guru of customer service today by USA Today, Time and Entrepreneur magazine. For the last 31 years, his sole focus is on helping organizations drive a service culture and create a customer experience through his technology built on practicality, simplicity, and common sense. With his credibility and focus on empowerment and the power of social media, he has the ability to emotionally communicate the power of the service strategy from top executives to the total work force. He is dynamic, hard hitting and inspirational. His experience provides a credibility that is critical to get management buy in. He will create an emotional buy in using measurable data that the CEOs respond to. His books are recognized by senior executives as the most powerful must reads in customer service. John’s message is based on common sense built around his 41 years of speaking and developing a high performance work force. Featured on Good Morning America, CNBC, PBS, newspapers, radio, and magazines from almost every corner of the world. John’s technology in books are in 11 languages and represented in 45 countries. John’s most recent book Moving Up, a step by step guide to creating your success, focuses on laying the ground work in success in life and business. P: John, it is so great having you here today. Thank you for being here. J: You are welcome Penny. P: Maybe you can tell the listeners about your background and how you became inspired others to achieve their dreams. J: I had started when I was 22 years old in the industry of goal setting, self-image, personal leadership, getting people to believe in themselves. I am 66 now so I have been at this stuff for a very long time. And then I, 1976, before many listeners, started to write my own programs on how to use recognition to motivate people in sales and management positions. Then in 1979, I saw an organization spending a fortune on trying to bring people to a place in business. Customer service did not exist. I though why is customer service so bad? The real reason is nobody has been trained on customer service. I wrote a program to teach the people the skills on customer service. It was released in 1980 called Feelings. Many people around the world have gone through that program. I now have spent 33 years on focusing on customer service longer than anybody in the world. P: Amazing. As you said, most of work has been focused on customer services and best practices around that, your new book Moving Up, it seems to shift from that focus from customer service. Can you tell us how Moving Up differs from your previous work? J: It is very inspirational. It’s light on customer service. The reason I wrote it is let’s say a company has 1000 employees and I am installing programs to get people to move to a higher level. And I believe the obstacle at every organization faces is that they say, you don’t understand, I am a janitor, I am a teller, a cashier, a receptionist, we have all of these self-imposed limitations. I wrote this program to get people to believe in themselves and see themselves differently. So not only do I have a training program, called Moving Up, I have books so individuals can buy it on their own. All of us have self-imposed limitations. I was very fortunate in that one. I was young and my mother was very inspirational and always told me I would be successful. My dad died when I was seven and we had no money. We were pretty poor. So I always wanted to be successful and then I started to learn what successful people do. Paul Myer was a mentor to me. He taught me how to set goals and invest and then I have been reading all of these books and listening to all these cassette programs and cd programs and self-improvement since I was 22 years old. P: They say the most important think is what you feed your mind..
J: I put the principles I have learned in my life and put them into the book Moving Up. First, its self-imposed limitations. We don’t dream or visualize. We settle for where we are at. Number 2, we don’t have goals. I think you have to have clearly defined game plan in the works. Look at the game plan all of the time. Most people have wishy washy goals or no goals. The result is whatever happens is fine because I really didn’t have a game plan. Just like playing a football game and if you win, its fine, if you don’t, its fine. P: they are too busy being busy. They don’t take a step back and look at what they want to achieve. J: Working hard is nice but why not work smart. I teach in the book, visualizations and affirmations. It’s kind of a game plan to get people to visualize. The beauty of the book is an individual can buy it for themselves or give it to a son or daughter or a relative, or a colleague. It’s an easy read. It’s a bit like the Secret. The Secret is a good book. One of the things I talk about in the book is that if you want to be successful you have to massage your mind. You can’t just buy the book and think I have read this book. So what? We live in a very negative world. People are pulling us down all of the time. Very few people are pushing us up. We need to feed our mind. Constantly. With positive stuff. If you read 100 books that are all telling you the same thing, eventually, you start walking the walk and talking the talk. YOu start to believe. But if you only read one book and next week somebody says that’s a bunch of crap. You are too young, too old, you’re white, you’re black, and we get all kinds of limitations that are all self-imposed. So we need people to really believe in themselves and then create a game plan and then work the game plan. P: With all of your years in customer service, it’s logical that you would focus on the individual. Right? It’s logical for me to have you cover both sides with all of your experience. J: CEO’s absolutely love the program. Let’s say I have 2000 employees. I believe that 2/3 of the work force just show up. They are kind of content with where they are at. The CEO got there because he or she were not content with where they are at. The goal is to get people to want to be extraordinary. P: That is really tapping into a self-motivation and purpose inside. Freeing the mind of all of those limitations that we are putting on ourselves. J: So if we can just get people to understand how much more they can accomplish, they can earn more money for themselves, for their family. They can have more out of life if they want. It’s totally up to the individual. It is their choice. P: Let’s go back to the indispensable employee. J: A person who is just average and does a nice job will probably hang onto their job. An indispensable employee is the most valuable person in the company. They can go anywhere they want at any time. How do you become that? You then do things faster. You learn more about the organization than anybody else. Let’s just say, I was a janitor in a company and they had 1000 employees. I use extremes in my examples. I want to move up and make more money. What would I like to do? Where do I want to go? Or maybe I am just a secretary in the company. It goes back down to the attitudes, the habits. Do I come in early? If closing is at 5:00, do you stay while everyone is leaving? Do you ask your supervisor or your boss for more things to accomplish? More things to do. Do you do things faster than anybody else? If somebody was on vacation are you knowledgeable enough to fill in for them? You want to be the single most important person in the company. Here is the attitude that some have. They say, when you pay me more money, I will do that stuff. Well, that is just the opposite. When you do that stuff, you will make more money. P: I am hearing you say it’s about adding value. The more value that you can add and owning that result and doing whatever it takes, whatever job needs to be done, like clearing out the trash cuz its full, then do it. Those kinds of things get recognized and I completely agree with that. I have seen it in my own career. Being into that position to say do whatever it takes and having those attitudes and values. Adding value. There is nowhere else to go but up. J: My first real job I was in college, I worked a company called Continental Can Company. I was in quality control, which was trash. I was working and I think the second shift and I volunteered or maybe even the first shift, or both shifts, I volunteered to do both shifts if they would give me two hours a day of overtime. I would get everything done in ten hours. They were a union shop. They couldn’t do it. P: In one job I had, someone needed to go get sandwiches because we were working through the night. I was lucky to be on that team. I volunteered to get the sandwiches and make sure all were taken care of and I did it with a smile. That is the key. It’s not just adding value but it’s about being a part of who you are. J: I have always been driven by the need to make more money. I think a lot of people are happy with the income with they have which is frustrating. P: Or maybe they are just afraid. Sometimes it comes down to the limiting beliefs that you mentioned before. They don’t know really what it means to have wealth. J: I teach in the book Moving Up is the friends you associate with is very important. Some of us hang out with people who are negative or we associate with people our own age that have the same level that we are at. We think like they do. I have always associated with people that were very successful, far more successful than me. When I was young, all of my friends were 20 years older than me. I hung out with people associated with success. Then you start to think that way. When you share your dreams with successful people they are going to push you. But if you share your dreams with people your age in the same position as you, they are going to say, you are crazy!! They may say, you are black, or you are a female, you are white or too old. You don’t have the right connections or education. P: Surround yourself with the people who will support your dreams. J: One of the wealthiest men in the United States, Bill Gates, spends several hours a day reading. But many of us don’t spend an hour a day fulfilling our mind and building our self-esteem and self-worth. We watch tv at night. What if you reduced tv by one hour a day and spent that one hour on personal development. Reading books on self-image and self-worth and leadership and management. Let’s say I want to be in sales. When I first started in the training business in 1970, I was starving to death. I made $650 gross income my first six months in business. I didn’t know how to sell. I taught myself how to sell. I read every book, training program I could find. Turns out that I was learning more about sales training. Wherever you want to go, you can fulfill your mind and develop those skills. P: I want to take that context further. Today we are talking about proactivity. Proactivity is that anticipating and preparing in advance. It’s part of what you are talking about with Bill Gates reading an hour every day. He is always in preparation of the next step and the next level. Proactivity is an essential element of the language of productivity. I have in my program ten essential elements which make up time and energy management and it makes up the language of productivity. In your book, you talk about the idea of laying this ground work for later success. Maybe you can just share a bit about what you mean by how they can get started and what is the ground work they need to lay for moving up. J: Let’s say I want to me in management. Usually if you are in management you make more money. When I was younger, I would look at managers and see that some were really incompetent. Some people are really good. What are the characteristics of those that are really bad? Write them out. Make sure you don’t do them yourself. What not to do. Then what are the characteristics of those that you really love? The successful ones and then work on those. Then secondly, in being proactive, what do I have to do to be promoted? One thing you might say is that it would be helpful if you knew all of the products and services at my company backwards and forwards. When you call a company up sometimes and the people you ask about the product, they say, well, I don’t know. A lot of people really don’t know. You can tell within seconds if you really know the product or service. Skills like taking a course in a college. I tend to use more books, or cd programs, but what sometimes what we do, we read one book. Or we attend one little course on leadership or management and we think we are ready. What are you doing to constantly enhance your skills? P: There is a difference between theory and application. It’s not just about reading the book. It’s about applying it and learning as you said, what to do and what not to do. Learning what works and applying it. J: Just keep looking for a few ideas for every book or course. If you hear it from 20 different people, eventually you start thinking that way. Then being proactive, you have to create the game plan. You say, right now I am the secretary and I would like to move up and be more successful. How do I get into management in this company? You might ask, say a company of 100 people. Ask people way up the line, what do I have to do to move up? What are the skills you want me to have? Implement the game plan. Write them down. Part of what we are talking about is performance. You can look at anybody and you can tell if they are working or not working. You can tell how effective they are. It’s so easy to move up. Honestly. Because there are so few people trying. We look at a company like an iceberg. There is very little room at the top and a lot of room at the bottom. I believe it’s the opposite. Flip the iceberg upside down, there is very little room at the bottom because that is where everyone is competing. Few people are at the top. P: Interesting perspective. Time for a break. Stay tuned. Welcome back and today we are speaking with John Tschohl about his newest book, Moving Up. P: I would like to summarize the five things I wrote down from our last session. What is essential and necessary in the groundwork that you are going to be setting in order to move up? First, is having a goal of where do you want to go and knowing what to do and what not to do. By observation of best and worst practices. Second, understanding the expectations from the company is what is needed for promotion. Third, is developing the skills and getting those necessary skills at each level of what you are looking for. Fourth, is repetition. Developing skills is not just reading a book. It’s implementing it and applying it. Five, you talked about really the game plan. Creating a map and actually going about implementing. Next, I want to talk about time management. How much of ourselves to we bring to our time. Adding value. How people feel about what they have accomplished. It is related to growth. You said setting a goal and reaching it. It’s in that growth component that gives you that feeling of being accomplished. J: I agree. You have x amount of hours in a day, read books on time management. What are you doing to work on the A projects. We get stuck in all of the C’s and forget about the A’s. If you can accomplish more in the day, you will achieve more. Part of that is decision making. If we procrastinate because we can’t make a decision, it also impacts our time. How do you accomplish more than anybody else in your company? You need better use of your time. Manage it better. P: Communication is key too. What kind of questions are we asking ourselves? We might be using the same words in saying are we doing things right or we can ask it in a different way, like, are we doing the right things? In that decision making and really deciding how we use our time, it’s what questions are we asking ourselves? What does it take to be successful? For people to reach their greatest potential? Is there an x factor in productivity or success? J: We have to develop skills. It could be to improve listening, selling, bookkeeping skills. As a bookkeeper, what are the skills you could learn to enhance how you are more effective? No matter what the profession is, there are skills to learn and we need to use our own time to use that. P: Would you consider the x factor to be self-development? J: I think it is. There are two steps to that. First, remove the self-imposed limitations. They are huge. Really believe you can do it and then you got to work the game plan. If you don’t have a game plan, you are never going to achieve it. Dreaming doesn’t do you any good. P: Self-development gives people that direction and I call it the skills and the mindset. The first thing they need is that mindset to get rid of the obstacles to really tap into that inner motivation which is then giving you that clarity of what it is that you really want and then the clarity of what skills you need to develop and take on. It’s about the skills and the mindset. I put a twist to it and say that the skills and the mindset are also about the energy and how you use the energy that you create inside. Same kind of thing just a way to explain it in a different way. The energy that you will bring to something is going to make all of the difference in what you are achieving. J: If you have a solid goal, you can touch it and see it and it’s specific, you create that energy. Because it’s something you really want. Then part of that is to remove the mindset because the mindset may be negative. P: You mention in your book that we are in an uncertain time in the economy for both employees and employers about taking few risks. Employers might be fearing losing employees who have become empowered and want to move up. I just wanted to tap into that. J: I believe the single objective of every company should be to have over happy costumers. If you have over happy customers, your competition is screwed and you have incoming money. The employee is afraid that they will lose their job if they make an empowered decision that is the principal reason they don’t use empowerment. Every employer wants his people to make empowered decisions. We spend too much time trying to get customers. The most important thing we can do is keep our customer. We just need people to use common sense and ask themselves, if this was my mother or best friend, what would I do? On the spot. P: It’s the small things, right? It’s about the employees taking the same level of ownership as the owners which gives so much more power behind the organization. J: You want to develop indispensable employees. The most important in every company is not the owner, it’s the level guys. If that person does a great job, you are in great shape. If he does a bad job, you are in bad shape. You can look like a hero or a bum. It all depends on your employees. P: How do leaders empower their employees? J: Two ways. Train them on empowerment. We have a training program called Empowerment a way of Life. We have a manager program we could use. You could read books on it. The principle thing is you have to be telling people you want them to make empowered decisions on the spot and it better be in favor of the customer. When they come back to you and say what do I do about this situation, you have to say, Charlie, make that decision yourself. You are empowered. When you see people being empowered them, reward them and make a big deal about it. Celebrate it. 99% of all employees believe they will be fired instantly if they make an empowered decision. P: Many cultures of organizations are holding back the employees from being empowered. J: No company has ever trained its employees on empowerment. They think they already know it. So why do they have to teach it? They don’t. So they need to have a course on how to make empowered decisions. P: There you have it. No matter if you are the employee or the employer, empowerment is the key that is going to help you move up as an individual. It’s time to take our last break. Welcome back. I am Coach Penny Zenker and we are joined today with John Tschohl. Welcome back John. P: In a nutshell, we were talking about that meeting and exceeding the expectations, either your boss or of your clients, are going to help you to move up as an organization or an individual. That is my little summary on it. We also talked about the idea that some people get trapped in a mindset of not wanting to move up. You spoke about it that they were not interested in making more money or just not taking control of where they wanted their career or growth to go. What do you think holds people back? J: People don’t believe in themselves. They associate with negative people. They are not hanging with the right people. They settle. They say they are too old, too young, whatever. All the stupid things that hold us back. P: What are some of the day to day things people can do to improve their self-image and to step into and take charge of their life and future? J: Using affirmations. Affirmations go on a 3 x 5 card and they are positive statements. I am successful. I am beautiful. I am making more money. I am the smartest person in the company. We put down statements that we look at every day. We put them on our computer or on our mirrors. Constantly looking at them. We have to convince our mind we are capable of what we want to accomplish. Use visualizations. A trip you want to go on to Paris. Get some photographs of Paris. Look at them all of the time. That is what helps drive us to get those things. Set goals. A game plan. Goals, need to be in all areas of your life. Financial, physical, social, mental, family. Let’s say you get divorced and your family life is a disaster. It’s going to impact your income and everything you have. If you are not doing anything physically, sometimes we are overweight. Take a look at your body. What can you do to look more professional? The way we dress. What is it that we can change? Buy books, cds and anything you can do to massage your mind. Don’t buy just one book and say to yourself you are going to be successful. P: There is no drive thru success. J: 1000 hours at the minimum every year on personal development. The best money you have ever spent. Don’t wait for the company to invest money in you. Be aggressive. What are you doing to enhance yourself? P: Back to visualizations. Look at all of the athletes. Especially the Olympians. They use them all of the time. Michael Phelps for example. One of the things his coach says is put in the tape. Every day he visualizes himself doing those swimming lanes and swimming perfectly every time. He sees himself standing on the podium and getting the rewards of doing it perfectly. They are so powerful. People really don’t embrace the art and the science behind it. There is science behind it. Many studies have been done that show that our brains don’t actually know the difference between what is real or imagined. J: My first books I read were like Think and Grow Rich. They are all about visualizations. In order to win the gold, if you don’t have clearly defined goals or visualizations and affirmations you probably won’t pull it off. P: It’s not any one thing. There is no drive through success. You have to do the work. You are going to want to do it smarter and surround yourself with the best. I have found there to be ten areas to focus on. Keeping the wheel in balance. J: Quantum leaps is a key word here. If you listen to the stuff that you are teaching people, they actually follow through on the productivity. Every company wants productive people. But not just average. You want to be the best of the best. There is no limit to what you can accomplish. P: Share some of the places our listeners can get their hands on your courses and programs. You have years and years of experience and value that you bring into these programs. P: Thank you John for being here and sharing your years of wisdom with our listeners. I am sure they took lots of notes. J: Thank you Penny. It was great. P: In summary, our listeners today, I have a challenge for you. I would like you to spend 5 to 10 minutes tonight thinking about and writing down what you are doing to prepare for your success. Write your goal at the top of the page and in one column include what are the habits and rituals that you engage in on a daily basis that support your values and long term goals. When you are done, reflect on this list. Then next to each item, write down what result you expect that to yield for you and how that supports your goal. I would like you to ask yourself, is this what I need to be doing with my time to really focus on proactivity? Setting that foundation for reaching this goal. Lastly, make a third column of the things that you need to start doing that you are not yet doing. What do you need to stop doing, that isn’t working for you or helping you to move up in your career? What are you going to continue doing? Take that challenge on. Let me know how that goes for you. Changing, Growing and Moving Up are choices we make. You write the story. You define the goal and you choose the path. Make the story passionate and powerful and it will be a best seller. The most exciting characters channel that passion and purpose into reaching that outcome by planning and anticipating changes. They create suspense by laying the groundwork to get there. They look for obstacles that could occur and they put measures in place to avoid them. That is exciting! The same is true for your professional development. Proactivity is derived from having a championship psychology. Understanding and implementing those strategies to optimize how you are proactivity approaching your dreams and desires and goals. They are also dependent on the integration of the other nine essential elements. Knowing and applying the language of productivity is paramount in your future success. If you like what you heard today, send us a message on Facebook and Twitter and let us know. 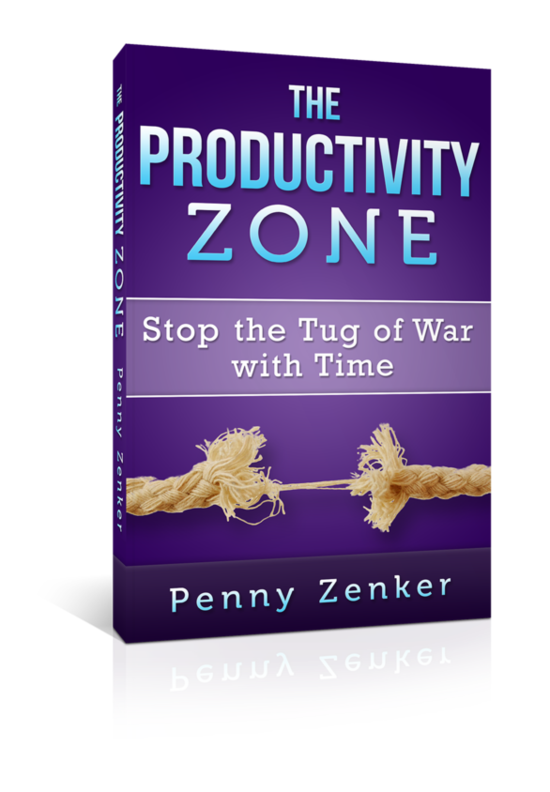 www.Facebook.com/PennyZperspective www.Twitter.com/pennyzenker Join us next week as we talk to another expert author and business leader about productivity and time. This is Penny Zenker reminding you to take charge of your productivity. It is a choice you can feel good about.